I’ve just about had it with credit cards. Like most people of my generation, I got my first card in college. Then, and for the next twenty years, getting credit was deceptively easy. I used it in all the typical foolish ways: to pay bills during periods of unemployment, to finance an unsustainable small business, to live beyond my means. In early 2007, after more than a year of concerted effort and lifestyle changes both major and minor, my partner and I paid off the last of our credit cards. (We still have the original mortgages on our house, but have never rolled outside debt into that loan.) I swore then that I would never carry a balance on a credit card ever again. And I haven’t. Purchase tracking — This is the big one, as any attempt to budget or control spending relies on it. No matter how diligent I try to be with recording my cash transactions, I still miss one from time to time — and never mind tracking my spouse’s cash, that’s like trying to catch raindrops with my tongue. Overdraft protection — I try to keep a minimum cushion in the checking account and everything else in savings, where it earns interest. Putting purchases on the credit card instead of debit frees me from constantly monitoring our available checking account balance to prevent stiff overdraft fees. Cash-back rewards — Our Costco AmEx card gives us a tiny percentage back (1-3%) on purchases. Last year it was just over $500 — not exactly chump change. This year we’re spending less, so the total amount will drop, but even so: 1% > 0. Vehicle insurance — On the rare, rare occasion when I need to rent a vehicle (which hasn’t happened in the last two years, but no doubt will at some point), the extra insurance provided by a credit card saves me money. The problem? 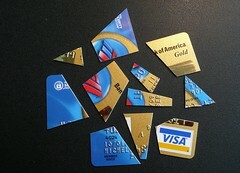 Now that I’ve mended my profligate ways, the credit card companies no longer consider me useful. Credit cards (and indeed the entire banking industry) work via cross-subsidies. Some of the people (a recent article quoting ‘industry lobbyists’ put it at roughly 40%) are the sort of credit user I am now, taking advantage of the benefits above without actually generating income for the issuing bank. The rest are the sort of user I used to be — carrying large balances at high interest rates, occasionally missing a payment and generating large fees and even higher interest rates. The income from that 60% has been enough to not just cover the other 40% but generate enormous profits for the banks as well. Then along comes the worldwide credit crisis and — salt in the wound! — an act of Congress that finally puts limits on the bank’s ability to gouge their customers. If you’re one of the 40% of responsible (aka ‘non-profitable’, from the bank’s perspective) credit users, be warned; they’re coming for you. They may have already begun. I’ll explain the first big change in part two. Uh oh…they’re coming for me, then! Seriously, though, I’ve always wondered about this “charge everything and then pay it off in full every month” thing. A lot of people I know claim to do it, but I know exactly what I would do if it were me: I’d charge more than I intended to and then I’d end up letting the balance ride and pay enough in interest to wipe out the cash back and then some. And I’m not much of a profligate spender. How do you avoid doing that? At this point I’m only using my credit card when there’s a chance of the merchant putting a hold on a larger amount: hotel reservations and rental cars, mainly. Hm, good question, maybe worth a post in itself. The short answer is a combination of a) considered spending always and b) a safety net (income, savings, or both) that can be put against the monthly credit bill if necessary. The ‘extra hold’ sometimes used by hotels is a good point that I missed, probably because it hasn’t affected me recently. Having some (unknown but large) amount of your checking account balance made unavailable can be problematic, for sure. ha, we’re both in credit-card post moods! Amex gouges merchants the most on those, but every credit-card company is getting at rock-bottom minimum 1% of what you charge through. Even with cash-back rewards and other account-maintenance costs on their end, any spending at all on your card usually leaves them a bit in the black. So, it’s clear that card companies will be and already are reacting to the credit crunch and upcoming new laws by clamping down. But it’s also clear that they don’t want those who run money through their card and pay it off to entirely go away. Toward that point — while I was in Seattle visiting, I mostly used my backup Visa (not my Amex), because yours seems an unusually Amex-hostile city. Usually I run $60 or so through this card every few months and immediately pay it off. In Seattle, I ran about $800 through (and paid it off with this week’s paycheck). As credit lines are falling all over, what do I get in the mail today? A notice that they’ve doubled my credit line on this card. Great post. I’m interested in reading your thoughts about the changes. I am pretty certain that the Costco Amex card does not provide rental car insurance coverage. “They’re coming for you”… I agree exactly! I’ve had my Citibank Home Rebate card for 8 years and I have NEVER missed a payment in 96 months, and I’ve paid in full for probably 94 or 95 of those 96 months and what did they do? They raised my rate from 7.99% to 14.99%! Great. Thanks guys for the customer service! Meanwhile the Fed Funds rates and treasuries have plummeted and they are giving 100million bonuses to Andrew Hall. Citibank, our government bank makes me hate big banks. I’m 10000% motivated to NEVER give them a cent more than I have to because of their actions. Disgusting. Hah, I have a financially responsible cousin whose credit card was canceled b/c he wasn’t making any money for them! His crime – paying off his credit card balance every month! AmEx, it was.